Join Jeff Parker for his evening-based Painted Bunting Photography Workshop ~ 2019 and photograph these vibrant and colorful birds. The workshop includes two photo shoots. The first one to help you hone in on problem areas that Jeff can help you overcome. The second one takes place during the sweet light at day’s end. 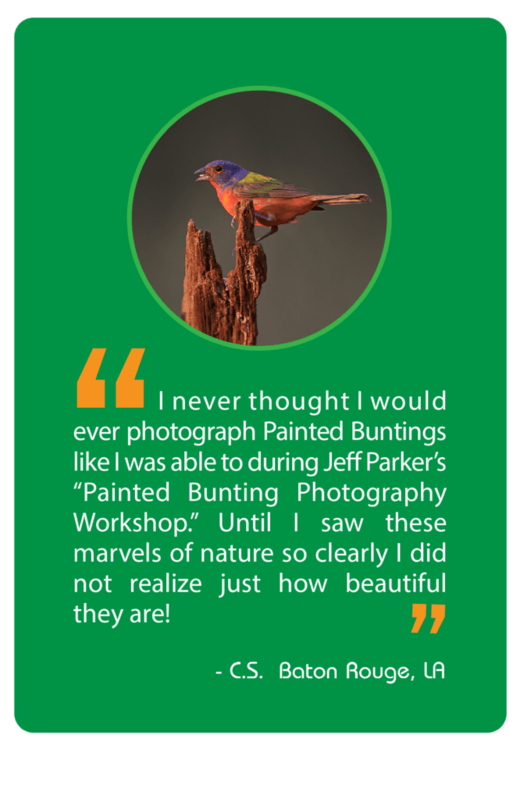 A rainbow assortment of colors make male Painted Buntings one of North America’s most colorful photographic subjects. Females -—- with their bright yellow-green feathers -—- also make great “models.”You’ll find these cover-loving birds throughout much of Texas during their summer breeding season. However, spotting and photographing them can be tough. But not at Red Belly Ranch where I’ve set up feeding stations & blinds specifically to make viewing and photographing them fully possible. While Painted Buntings have received a IUCN Conservation Status of “Near Threatened,” we’re blessed with these beauties each summer during their breeding season. Here you can watch these dazzlingly decorated male members of the Cardinal family perch in the open, at special set-ups, photograph both males and females. NOTE: Even when I have 3-4 breeding pairs, however, the birds will only show up once every 20-30 minutes. The workshop includes instruction on songbird photography techniques. We’ll focus on set-ups, backgrounds, exposure, and lighting as it relates to creating your best images. To maximize photo ops & your experience, I’ve limited each workshop to four (4) participants. 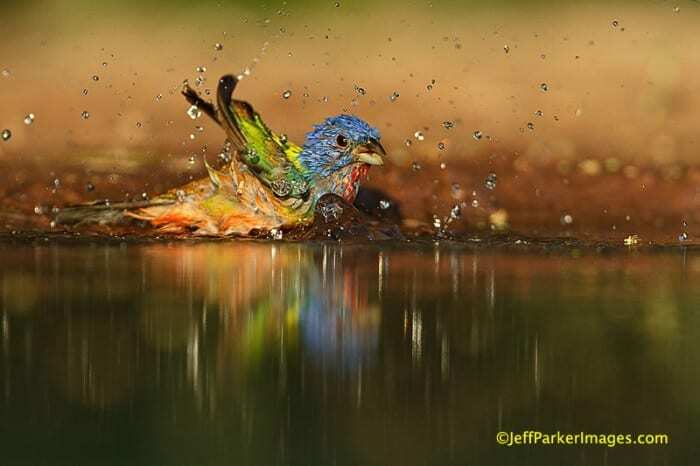 Each Painted Bunting Photography Workshop ~ 2019 includes an early dinner, served on-site. Each workshop takes place from 2:00 p.m. until it’s too dark to shoot (approximately 9:00 p.m.). 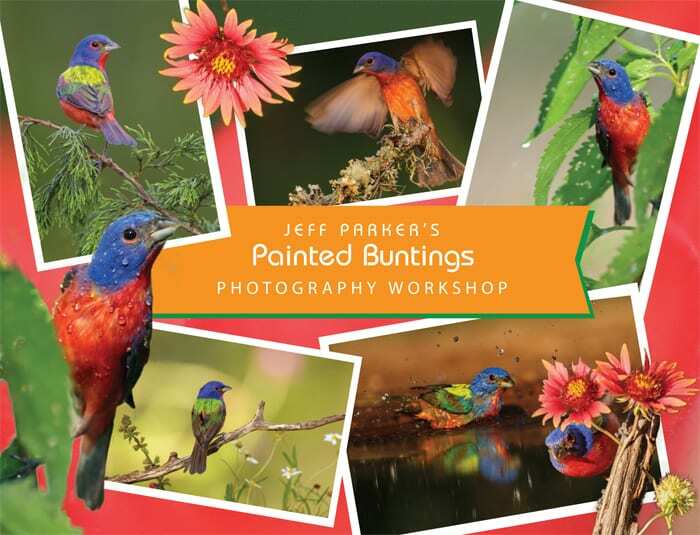 Wondering what equipment you’ll need for this “Painted Bunting Photography Workshop?” Click on this EQUIPMENT CHECKLIST (PDF) to find out what he suggests. If you have any questions please do not hesitate to contact me. A tripod is a must. And in order to photograph these itty-bitty birds you’ll need a big lens. If you don’t own one LensRentals.com is a great place to rent one. • 2:00 p.m. ~ Arrive. Lodging, transportation to and from workshop, other meals. If you’re interested in lodging nearby, check out the list below. There are B&B’s and other choices in Smithville (8 miles away), La Grange (17 miles away), and Bastrop (23 miles away). Red Belly Ranch is located 8 miles from historic downtown Smithville, Texas’ first certified Film Friendly Community where “Tree of Life” starring Brad Pitt and at least a dozen other films have been made. While visiting us, be sure and put aside some time to check out Smithville’s wonderful historic Main Street, including its nice collection of artisan shops and other unique shops, as well as the Lost Pines Artisans Alliance. The Red Belly Ranch is located 8 miles from historic downtown Smithville. It takes about 15 minutes to drive to Red Belly from Smithville. It takes about 25 minutes to drive to Red Belly from La Grange. It takes about 35 minutes to drive to Red Belly from Bastrop. SMITHVILLE has three B&B’s and one budget motel. It takes about 15 minutes to drive to Red Belly from Smithville. SPACE FOR: Only FOUR (4) in each workshop. (Follow the provided link or go to link under “MORE” on sidebar to the right.) Thanks!